As the debate over corporate inversions reignites over Pfizer’s move to acquire Irish-based company Allergan, Ireland is reporting a massive surge in corporate tax revenues for 2015. Ireland’s Department of Finance recently announced that from January to October, it has collected €4.75 billion in corporate tax revenues, 74% over its target for the month. By the end of the year, Ireland is expecting to collect €6.7 billion in corporate tax revenue, an increase of 45% over 2014 revenues. As you can see in the chart below, this is a huge increase revenue over previous years and marks a return to pre-financial crisis revenue levels. Did the corporate tax fairy decide to generously slip extra receipts under Ireland’s pillow? Not exactly. The Irish Times reports that a great majority of the surge in tax revenues may be attributed to multinational companies, such as Apple, booking increasing levels of profits in Ireland. This is part of a global trend, where companies seek to mitigate their corporate tax burdens by moving income from high-tax jurisdictions, such as the United States, to low-tax jurisdictions, such as Ireland. It is unlikely that Ireland will continue to experience such dramatic increases in tax revenues, but its economic environment and competitive tax policy certainly point to steady increases in corporate tax revenue going forward. Ireland is attractive for foreign investment because it offers skilled, English-speaking workers and offers access to the Eurozone. These attributes, along with a corporate-friendly regulatory regime, have created a hospitable and attractive location for multinationals to establish headquarters. The competitiveness of Ireland and other multination-friend countries weigh considerably on U.S. corporate tax reform. In comparison to other countries like Ireland, the U.S. has one of the least competitive tax systems, partially due to its high statutory corporate tax rate. If the U.S. corporate tax rate is lowered to be more competitive with foreign rates, companies would be incentivized to retain profits and investments within the U.S. Recently, Tax Foundation Economist Gavin Ekins published a paper analyzing the impact of a lower U.S. corporate tax rate on U.S. corporate tax revenues. 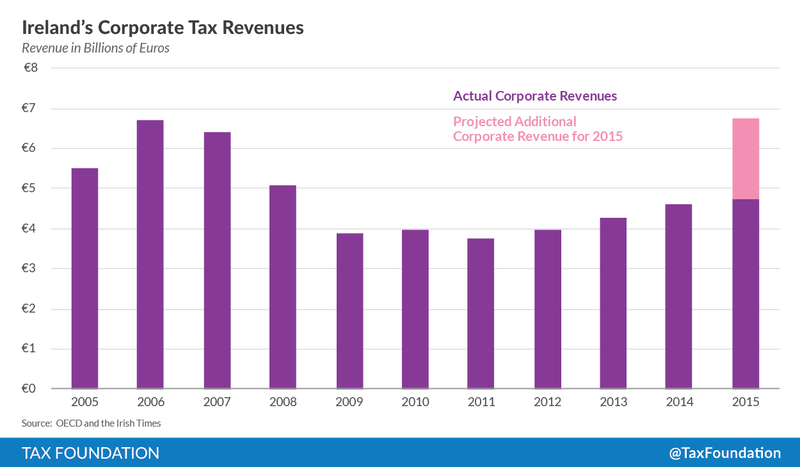 By lowering the corporate rate from 35% to 30%, for example, the U.S. may gain as much as $43 billion in corporate tax revenue. It is entirely logical to push back and argue that the U.S. doesn’t need to offer a more competitive tax system simply because the rest of the world is offering significantly more generous tax benefits. Slower and more calculated progress is in fact inherent in the structure of U.S. government, something unique relative to foreign parliamentary systems that may pass their Finance bills in a matter of months. However, fundamental tax reform in the U.S. is 30 years overdue, and much has changed in that time span. The reality of international taxation today is that multinational companies are constantly strategizing, countries are constantly creating new ways to attract investment, and international efforts, such as the OECD’s Base Erosion and Profit Shifting (BEPS) project, may take a long time to have a substantial impact. By standing still, the U.S. is gradually losing tax revenues, losing domestic investment, and most importantly, losing its future.